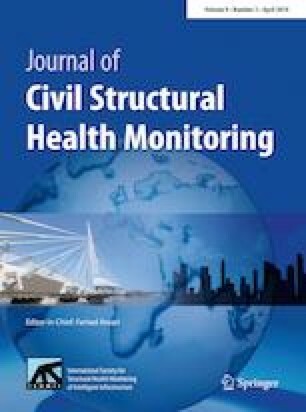 This paper presents the application of a hybrid structural health monitoring approach for condition assessment of cable-stayed bridges. Information from the structure’s quasi-static response, global vibration behaviour, visual inspection, traffic data, global positioning system, and local vibration test of cables are incorporated into the assessment process. Signal processing techniques and monitoring parameters to achieve an accurate identification is discussed in detail. A rigorous hybrid assessment method was used to evaluate the structural integrity of cables through incorporating visual inspection, ultrasound test, and local and global vibration analysis data. The framework was applied to a long-span case-study bridge in New Brunswick, Canada. Condition of primary structural members including stay-cables, bridge girders, and the orthotropic steel deck were successfully identified. Other structural parameters such as the bridge deck non-structural mass was also evaluated. Authors would like to thank the Natural Sciences and Engineering Research Council of Canada (NSERC) and the New Brunswick Department of Transportation and Infrastructure (NBDTI) for supporting this research.